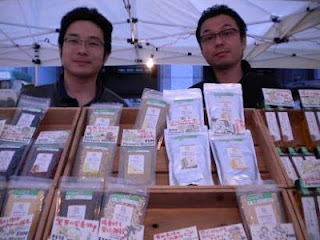 Hirota brothers of GNS at UNU Market with tons of cool, organic grains! This weekend there are markets, but the pickings may be a wee bit slim given the Obon Holidays. Many people will be gathering with family or traveling to gather with family during this time, so be prepared for a smaller number of vendors at some markets. For our part, we'll be at my farm's annual barbecue whooping it up with friends and enjoying a local round of fireworks!